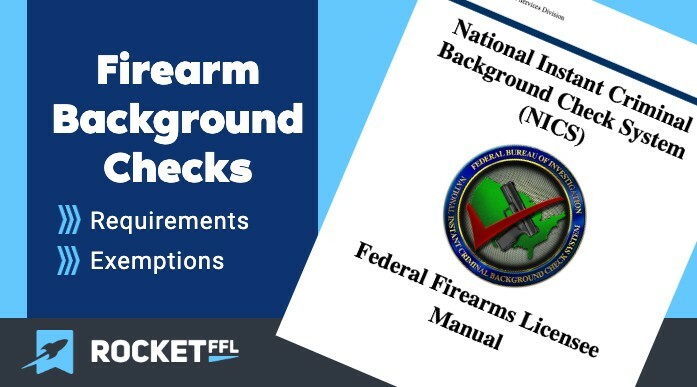 Before purchasing a firearm from a licensed gun dealer (FFL), the customer must complete a federal form and, in most cases, undergo a criminal background check. In order to purchase a “standard” firearm from a licensed gun dealer (FFL), the customer must first fill out the ATF Form 4473. The Form 4473 requires information about the identity of the purchaser and their current residential information. This not only provides a method for law enforcement to contact/find the purchaser if needed but it also confirms the purchaser’s state of residency. For handgun purchases, the purchaser must be a resident of the state where the FFL is located. For long gun (rifle and shotgun) purchases, however, an out-of-state resident may purchase a rifle or a shotgun in any state as long as it is legal in both the state of purchase and the purchaser’s home-state. The 4473 then asks a series of yes/no questions to determine whether the purchaser is a prohibited person and requires that the purchaser signs the form to confirm the accuracy of the information. The gun dealer/FFL checks a valid government issued ID from the purchaser, fills out information about the firearm(s), and then conducts a background check (if applicable). After a successful background check and payment, the purchaser may take possession of the firearm. In order to purchase an NFA firearm, the customer must fill out an application and send it directly to the ATF along with a special tax (usually $200), their fingerprints, and a passport photo. Then, they get to wait many months (currently around a 10 month wait) for approval before they are lawfully allowed to possess the firearm that they already paid for. In this case, the ATF conducts the background check. When someone purchases a firearm from another individual within their same state there is no background check required under federal law. Some states do require that background checks are conducted, even when the transaction happens between two private individuals (often called private party transactions). However, if the firearm is being moved from one state into another for sale, then the firearm must be shipped to a licensed gun dealer (FFL) in the purchaser’s home state and the transaction may only continue as detailed above. The Brady Handgun Violence Protection Act of 1993 (Brady) required, among other things, federal background checks for firearm purchases from Federal Firearms Licenses (FFLs). Later, in 1998, the FBI created the National Instant Criminal Background Check System (NICS). After a customer fills out the Firearm Transfer Record (Form 4473), the FFL must normally conduct a background check through NICS by phone or computer. Some states have decided to do these background checks themselves instead of rely on the federal NICS system. These states are called Point of Contact (POC) states. Some other states use their own system for some purchases (e.g. handguns) and NICS for others (e.g. rifles and shotguns). These hybrid states are called partial-POC states. FFLs in POC and partial-POC states must use their respective local system for background checks for certain/all firearms. Our Get Your FFL course covers the requirements of each state for more information. As an exemption to the NICS requirement for non-POC states, some state-issued CCW/handgun-carry permits can be used. This is because the background check process for some of these states is at least as good as the check performed by NICS. This saves time for both the FFL and eases the burden on NICS. When a customer presents a qualifying permit, the FFL can simply check question #21 on the Form 4473 which reads, “No NICS check was required because the transferee/buyer has a valid permit from the State where the transfer is to take place, which qualifies as an exemption to NICS” and fill out the information about the qualifying permit. The ATF maintains a list of qualifying permits that can be used for exemptions to the NICS requirement. Each qualifying permit has its own requirements (see below) but all of them qualify as alternatives to the background check requirements of the Brady law for no more than 5 years from the date of issuance. This is why states with permits that last longer than 5 years aren’t on this list. This chart is only valid as of the date of this article. You must check to see current information on ATF’s website. If you signed up for either our Get Your FFL or ATF Compliance course, you would receive an automatic update of this change, and all other firearm rules and regulations changes, straight to your email inbox. Concealed weapons permit issued on or after August 1, 2013, qualifies as an alternative to the background check requirement. Permits to acquire and licenses to carry qualify. Permits to acquire and permits to carry concealed weapons qualify. Concealed handgun licenses issued on or after July 1, 2010 qualify as alternatives to the background check. Concealed Deadly Weapons License (CDW) and Judicial Special Status CDW issued on or after July 12, 2006 qualify. Concealed handgun permits issued on or after March 9, 2015 qualify. Licenses to Purchase a Pistol qualify. Concealed Pistol Licenses (CPLs) issued on or after November 22, 2005, qualify as an alternative to a National Instant Criminal Background Check System (NICS) check. CPLs issued prior to November 22, 2005 and Temporary Concealed Pistol Licenses do not qualify as NICS alternative. Handgun Carry Permits with expiration dates of Aug. 1, 2019 and later qualify. License to carry concealed pistol or revolver issued to individuals under Miss. Stat. Ann. § 45-9-101 qualify. (NOTE: security guard permits issued under Miss. Stat. Ann. §97-37-7 do not qualify). Concealed handgun permit qualifies as an alternative. Handgun purchase certificates qualify. Concealed carry permit issued on or after July 1, 2011, qualify. Permits to purchase a handgun and concealed handgun permits qualify. Concealed weapons permits issued on or after March 23, 2015, qualifies as an alternative to the background check requirements. Concealed pistol license issued on or after July 22, 2011 qualify. Concealed handgun license issued on or after June 4, 2014 qualify.